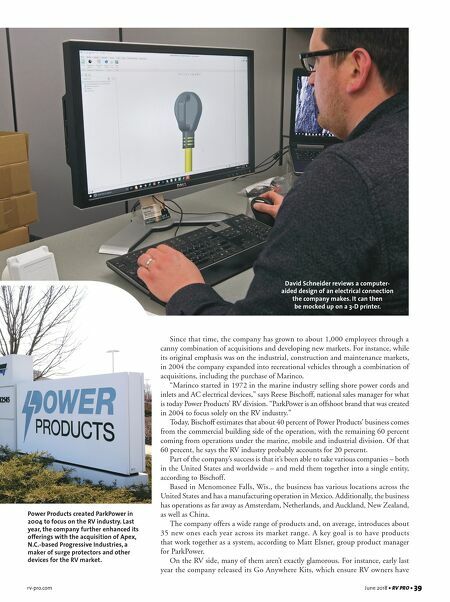 38 • RV PRO • June 2018 rv-pro.com A F T E R M A R K E T F irst and foremost, the people at ParkPower see themselves as problem-solvers. Not only do they want to make it easier for RVers to manage every aspect of their electrical supplies, but they have plenty of access to scores of people thinking about the best ways to do it. And not just in the RV market, but in some related industries, as well as in the corporate family tree. Through it all, they want to come up with the types of products that in 10 years customers will wonder how they ever managed without them. A Solid Background Perhaps not surprisingly, ParkPower's parent company, Power Products, has a long history in the electric industry. Its original predecessor, Gardner Bender, began in 1959 making bending units for conduit bending, as well as hand tools. 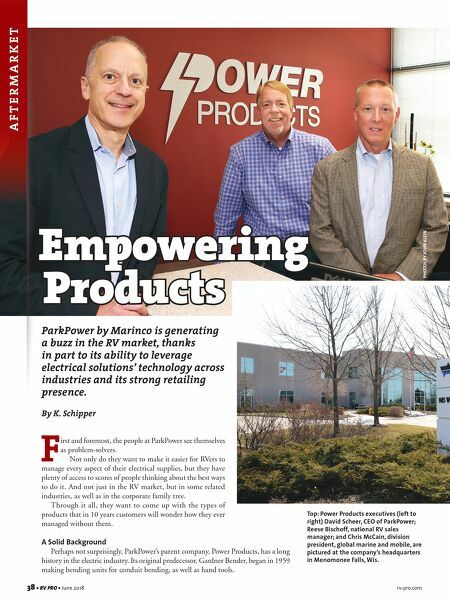 ParkPower by Marinco is generating a buzz in the RV market, thanks in part to its ability to leverage electrical solutions' technology across industries and its strong retailing presence. By K. Schipper Empowering Products PHOTOS BY JOHN KLEIN Top: Power Products executives (left to right) David Scheer, CEO of ParkPower; Reese Bischoff, national RV sales manager; and Chris McCain, division president, global marine and mobile, are pictured at the company's headquarters in Menomonee Falls, Wis.